Shelf Check: Cards Against Librarianship: Let's play! Cards Against Librarianship, the starter deck, is here. Please play and give feedback so it can be as much fun as possible. You can download the deck* here. *Huge thanks to Thomas Maluck, Carl Hess, and various folks on Twitter and the ALATT Facebook group for contributing card suggestions. *There are many different forms of librarianship, and while I tried to keep the deck mostly general, I have mainly worked on the public-facing side of public libraries and I'm certain that's reflected. I took card suggestions from folks with different experiences, but if, due to lack of niche knowledge and after a simple Google search, I couldn't understand why they were funny, I left them out. I highly welcome and will link to specialty "Expansion Packs"--for ex, "Archivists' Expansion Pack"--as long as the cards in them are phrased to be compatible with as many of the cards in this starter deck as possible. Blank cards are provided above; if you want them to match exactly (not necessary), import each blank into PicMonkey or something similar and type in Arial. *Creating question and answer cards that are compatible in a maximum number of situations was more challenging than I expected. For this reason, a few of the cards included in the preview versions posted here earlier did not make the final deck. Suggestions in this arena are welcome, too, as well as feedback as to the playability and compatibility of the starter deck. Please send them to elloyd74@gmail.com with the subject line "Cards Against Librarianship" (I sometimes miss notifications of comments on this blog). *If you make an especially hilarious combination that you want to share, please do so on Twitter with the hashtag #CardsAgainstLibrarianship (or in the comments below, if you're not on Twitter). IMPORTANT INFO: Cards Against Librarianship is inspired by Cards Against Humanity, and, as in CAH, you will find cards in CAL that refer to sexuality and other topics generally considered taboo in the workplace. If you've never played CAH, you might take a peek at the content of their cards before deciding if CAL is a game you want to look at and play with colleagues (or even alone). As a general rule, CAL is tamer--I didn't go anywhere near CAH's infamous "Toni Morrison" and "Pac-Man" cards--but what I feel comfortable including and what you feel comfortable reading may certainly differ. Using the blank cards provided above, folks can swap in their own tamer cards or raunchier cards, depending on preference. 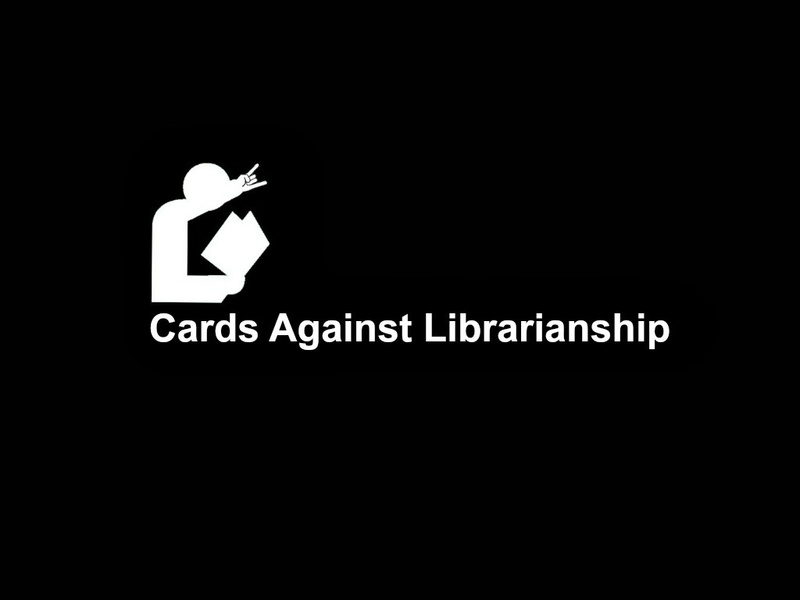 Cards Against Librarianship by Emily Lloyd is licensed under a Creative Commons Attribution-NonCommercial 4.0 International License. Hi, Emily M--see update in above post! Pdf now available, thanks to Mike Hungerford. Download here.